Global Golf Sales, in Cooper City, Fla. (Fort Lauderdale), is the leading golf distributor in the country specializing in golf grips, repair supplies, golf accessories and custom printed items. Global Golf stocks all the major golf grip brands such as Golf Pride, Winn, Super Stroke and Lamkin. Global Golf Sales is your source for Golf Pride Grips and are the only authorized Golf Pride distributor in Florida. The team at Global Golf Sales is lead by owner, Steve Sponder. Sponder's team is comprised of golfers, and they are there to service the golfers and the golf professionals of Florida. Sponder, an avid golfer himself, teamed up with Marc Rosenbaum, also on staff at Global Golf, to capture the FSGA's Super-Senior Four-Ball Championship in 2018. Two other Global Golf employees, Kasey Denesevich and Scott Jacobs, regularly compete in FSGA and USGA Championships. Denesevich's 2018 season was highlighted by capturing the FSGA's Two-Man Shoot-Out, earning an automatic selection on the Florida Cup South Team, and qualifying in the fall of 2018 for the 2019 USGA Four-Ball Championship. If you need excellent service, one-day in state shipping, and to talk to your peers who both know golf, and know golf supplies, Global Golf Sales is the team to turn to. For over six decades, Golf Pride has been the global leader in golf grip innovation and technology, from the invention of the slip-on grip to groundbreaking advancements in cord with our new Brushed Cotton Technology (BCT®) to the introduction of the hybrid category of grips. Today, Golf Pride® has laid claim to more major wins than any other grip company. More than 80% of Tour professionals choose to play Golf Pride grips and not one is paid to do so. In this age of multi-million dollar endorsement deals, that’s the strongest endorsement of all. So, whether you’re a Tour pro playing a major, a rising amateur, or an everyday golfer, you can rest assured knowing you’re playing the #1 Grip in Golf. The grip is your only connection to the golf club. Just like the club head and shaft of your driver or iron, your grips should be fit to your hand size, performance needs, and playing conditions. Finding the right size, taper profile, and performance attributes in a grip can improve distance, accuracy, and consistency throughout the bag. Think of it this way: You wouldn’t buy a slip-on pair of loafers to wear on the basketball court; You would want a pair of shoes that offers the support & performance you need. You also would not want to wear a shoe that was two sizes too small or large. What size grip should I play? 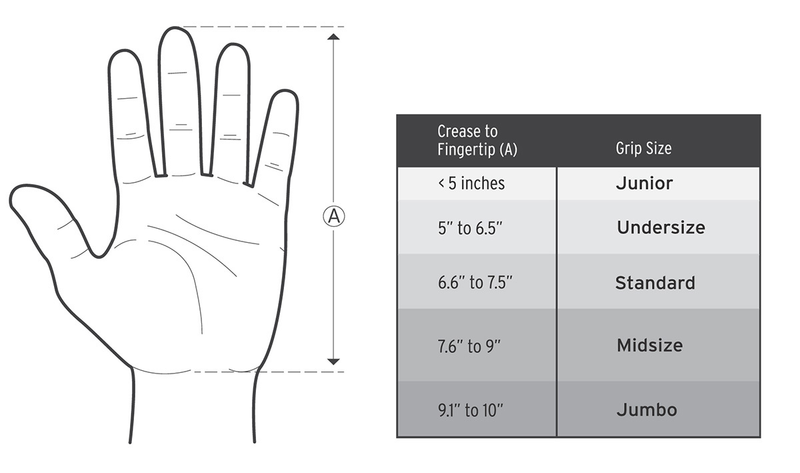 As a general rule of thumb, most golfers can determine the proper grip size by their hand size or golf glove size. A glove size of Men’s XL or larger typically means a golfer should consider a midsize or jumbo grip. A glove size of Men’s S or smaller suggests a golfer could benefit from an undersize grip. Otherwise, most players will benefit most from a standard size grip. However, there's more to consider than just hand size when choosing the correct golf grip. Tension in the hands and arms: If you feel you’re squeezing the club too hard, your grips could be too small. More than 90% of Tour players build up their grips with extra wraps of tape. Over 50% of the grips Golf Pride sells at retail are Midsize or Jumbo. Tour professionals and a large number of amateur players have discovered the value of larger grips… Could bigger grips benefit your game? The type of weather conditions a golfer plays in most often should be part of the equation when considering what type of grip to play. Wet Conditions: Like snow tires on a car, grips that provide traction even when wet will make the game easier for golfers who play in wet conditions. Hot / Humid Conditions: Similar to wet conditions, If you play in hot, humid weather often, it’s likely your hands sweat while on the course, which can cause loss of traction. If you play in wet weather or have hands that perspire, consider Golf Pride’s full-cord grip offerings (Tour Velvet Cord, ZGRIP Cord, or ZGRIP ALIGN) or a hybrid grip model that features cord in the top hand (MCC, MCC Plus4, MCC ALIGN or MCC Plus4 ALIGN). Dry / Fair Weather: In conditions that are dry, Golf Pride’s all-rubber grip models are good options, though full-cord or hybrid models perform well in all conditions. Golf Pride makes a variety of grips that cover the entire spectrum, from soft to firm and tacky to rough surface texture. Softer grips, such as the CP2 Pro, CP2 Wrap, and Tour Wrap 2G, can reduce vibrations and feedback from impact, decreasing stress on the hands and upper extremities. Players with arthritis in the hands or elsewhere should play soft grips. Firm grips, like the full-cord ZGrip and the hybrid MCC and MCC ALIGN, provide more feedback from impact and can feel more stable throughout the swing. Generally, Golf Pride’s softer grips have a ‘tacky’ feel, while firmer grips have a rougher surface texture that provides more traction. There’s no wrong or right answer when it comes to finding your perfect golf grip. It simply comes down to personal preference. Visit www.globalgolfsales.com to see the newest Golf Pride grips for yourself and find the right grip fit for your game.